Includes reference sources from selected dictionaries, directories, and encyclopedias for many subjects including: business, history, law, literature, medicine, religion, science, and the social sciences. 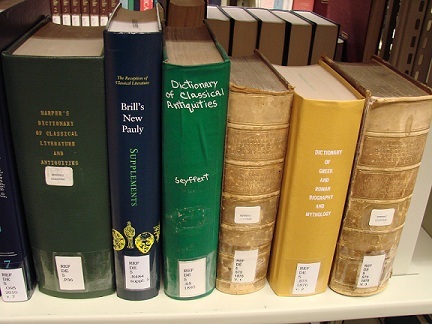 This database provides a fully searchable online version of the Oxford English Dictionary. The database provides pronunciations and definitions of words, but also provides information on etymology (the origin/history of words), a chart of noteworthy dates the word is used in publications, and information on alternative spellings. The database also has a "Lost for Words?" link, which takes users to a random word in the dictionary. The database retains some of the feel of browsing the print dictionary by showing an alphabetical list of entries on the left side of the screen. The list shows words that come both before and after the selected entry. provides dictionary and encyclopedic information in many areas. Oxford Reference Online brings together language and subject reference works from one of the world's biggest and most trusted reference publishers into a single cross-searchable resource. Foley Center Library's Reference Collection contains over 7,000 print reference sources including encyclopedias, dictionaries, handbooks, statistical materials, and more. The print reference collection is located on the west side of the reference desk on the main floor of the library. To locate reference materials at Foley Library, please search the library collection using PRIMO or ask at the Reference Desk for assistance at any time.